The nightingale - made immortal in an ode by famous British poet John Keats - could become extinct within 30 years, scientists have predicted. Population of the bird that has been an inspiration for generations of poets and romantics, has drastically gone down by more than 90% in the last 40 years, says the study by the British Trust for Ornithology. The bird would be upgraded to " red status" - signifying the highest degree of conversation concern. The nightingale's decline has been blamed on the population explosion of the muntjac deer, which has reduced the availability of the bird's habitat in the woods. The muntjack is a small deer native to Asia, including Sri Lanka, India, China and Japan; and was introduced to Britain by accident when some escaped in 1925 from the Duke of Bedfordshire's estate. Pressures on its habitat in sub-Saharan African, where the bird goes during winters, as well as along its migration route to UK have contributed to the threat. The trust is searching for solutions to halt the bird's extinction. 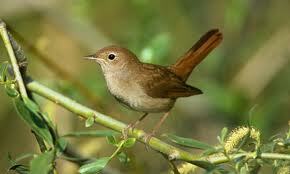 It has launched the Nightingale Appeal and a CD of the bird singing, profits from which will go to research.